1. Know what you’re up against. Which breed is your pup? This is a very important question that should require more than a single-word answer. 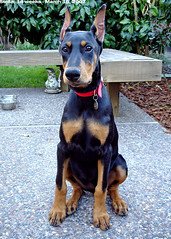 Most guard dog breeds grow to be large adolescent dogs with very dominant tendencies. Small dog breeds on the other hand are cute little furs even as adults and they can suffer from insecurity barking whenever they’re around other dogs and people. Smart dog breeds can also get bored with repetitive training routines very quickly. Knowing what breed you have on your hands helps you plan a good house training program for your new pet. 2. Start immediately. This means commencing puppy house training the very moment he sets foot into his new home. Obviously, your planning ought to have been done before the homeward trip. This is very important as the new environment should also bring new rules. It’ll help the pet get settled into a routine you approve if the rules have been set and are being enforced from the start. 3. Stick to a schedule. Map out something you can work around. You’re in the driver’s seat, the leader of the pack. Your puppy takes on after you. Dogs don’t understand human language. That’s why the most effective dog training methods use the psychological precepts of pre-conditioning. Your puppy training schedule should include feeding, eliminating and sleep/wake-up time. Feeding and sleep/wake up time, you can chart up right away. Eliminating, you can observe a pattern for a few days and develop it around the schedule. No free feeding while training. 4. Take control. You have to know everything about your dog at all time. You should know where he is and what he’s doing. This prevents accidents, mistakes and frustrations. If there are other people in the house besides yourself, make sure they know what the rules are and enforce them so as not to confuse your dog. Of course, you can’t be with your dog 24/7 to supervise what he’s doing. While you’re still house-training your new pet, you have two options: Either assign a specific person to take over supervising your dog while you’re out, or confine your dog to a puppy-proof room. Often, it is more feasible to do passive house-training than finding someone to take over. Therefore, when you get a new puppy, designate one room in the house as the puppy training room. When you have to be gone for long stretches of time, lock your puppy in the room with his supply of food, water and some toys. This will ensure your house is still intact when you return, and your dog is safe and unhurt.